as published in MG V-8 Newsletter, Volume V Issue 2, August 1997. (originally published with two black and white photos, one with car and one without. 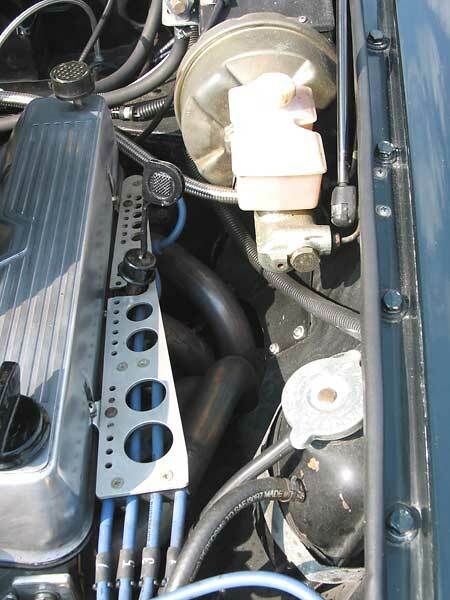 Engine: Rover 3.5L V8 from a 1980 Rover 3500 sedan. Crane camshaft (#621262) with 0.445" lift. Crane lifters (#202HY). Offenhauser intake manifold (#7001). Edelbrock 500cfm 4bbl carburetor. Mallory Unilite distributor (#3764301). Mallory Pro-Master ignition coil (#29440). Cooling: MGB V8 radiator (soon to re-cored to a higher efficiency core) and MG oil cooler. Exhaust: tubular headers with Jet-Hot ceramic coating. Transmission: 1980 Rover LT77 5-speed manual. Rover bellhousing. Rover flywheel. Rover clutch. Triumph TR8 clutch slave cylinder. Rear Axle: stock MGB, with original 3.909:1 gears. Driveshaft manufactured using Triumph TR-7 flange to mate with Rover transmission, MGB flange to mate to differential, and heavy steel shaft tube. Brakes: drilled front brake rotors. Wheels/Tires: Panasport 8-spoke 15x6 aluminum wheels. Toyo P195/60R15 85H tires. Instruments: recalibrated speedometer and tach for V-8. Speedo is 140mph from an early Jaguar. (The cooling fan indicator light is wored to the "demist" light on the speedometer.) Mallory water temperature gauge in stock water temp gauge position. Tachometer recalibrated by Nisonger, 570 Mamaroneck Ave., Mamaroneck NY 10543 (914) 381-1952. Speedometer recalibrated by Auto-Air, Orlando FL (407) 834-1065, ask for Jim. Weight: before conversion 2840#, after conversion 2580#, reduction of 256#. Mileage: since the car was converted to V-8 in 1993, it has been driven over 80,000 miles. The original mileage was about 46,000 miles, for a total of over 126,000 miles. Cost: about $5-6000, not including car. Tips: get all of the parts on hand, or know where you can get them, before you start. 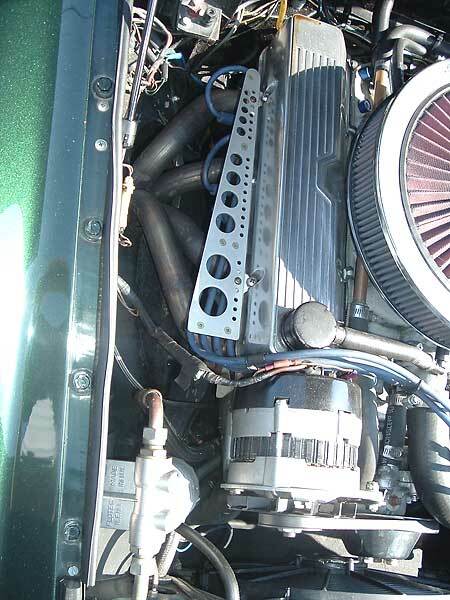 Rover 3.5L V8 from a 1980 Rover 3500 sedan. Offenhauser intake (#7001) & Edelbrock carburetor. Evidently Bob upgraded to an aluminum crossflow radiator after the original HIWD write-up. These stainless steel "RV8-style" (through the fender) headers are a nice upgrade too. Fancy spark plug wire routing. Although Great Britain's Rover Group said it will not export its new V-8 powered MG convertible to the colonies, that didn't stop Longwood's Bob McClain from creating what might just be the next best thing. Using factory-made parts, McClain built his own V-8 powered MG roadster, and he did it for far less than it would have cost to buy the new MG or any other sports car. The new MG, called the RV8 is sold only in Great Britain. 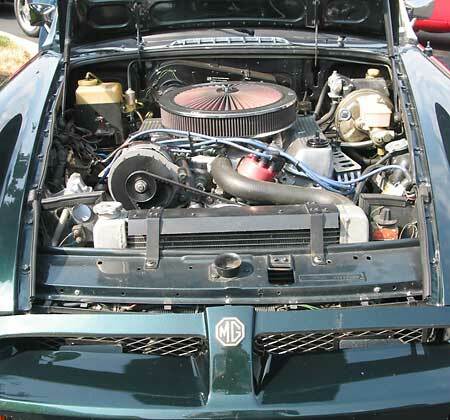 Though it costs close to $40,000, it is basically the same car as McClain's 1980 MG V-8. McClain, 54, a British sports car enthusiast since he first owned a Triumph Spitfire in 1972, said he spent about $9000 on the project. By comparison, a new Mazda Miata - which comes with only a four cylinder engine - starts at more than $16,000, and it wouldn't be able to keep up with McClain's MG. McClain said he'd long dreamed of building a V-8 powered MG, and Rover's resurrection of the MG sports car earlier this year was the catalyst he needed. Rover began manufacturing the MGB's body shell a few years ago for enthusiasts who wanted to restore their older cars. Demand for the bodies has been so great that Rover developed a new version of the MG and modified it - as if the car had never gone out of production. 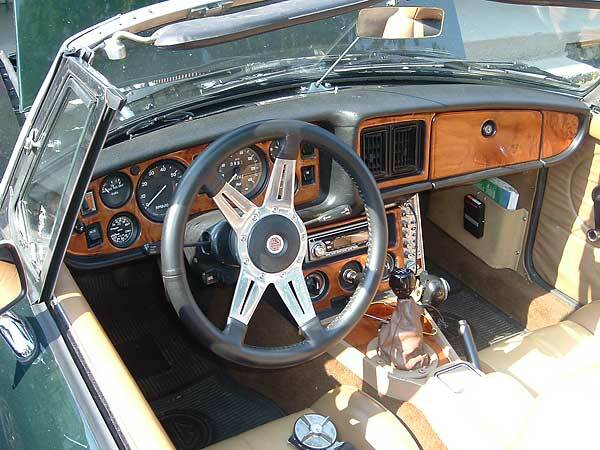 The MG RV8 has bulging fenders and new taillights, plus an updated interior outfitted with wood and leather - traditional accouterments for British sports cars - and several high-tech improvements such as an alarm system, new gauges and switches. Rover hand builds each MG RV8 at the rate of 15 per week in a special factory that also makes bodies for the Triumph TR6. According to Britain's largest car magazine, Autocar & Motor, the RV8 is sold out until next year and buyers are paying more than sticker price. McClain spent six months holed up in his garage to build the MGB V-8. First he spent $3,600 on a used, all-black Limited Edition 1980 MGB in good condition. 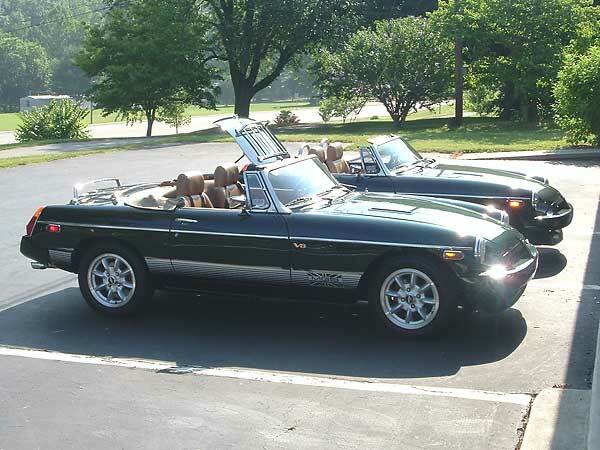 That model was the last version of the famous MGB roadster, a sports car that sold about 550,000 copies worldwide from 1962 to 1980 and still holds the title as the most popular two-seat convertible sports car ever made. McClain spent another $2,500 to buy and build an aluminum Rover V-8 engine and five-speed manual transmission - the same drivetrain Rover uses in the 1993 MG. 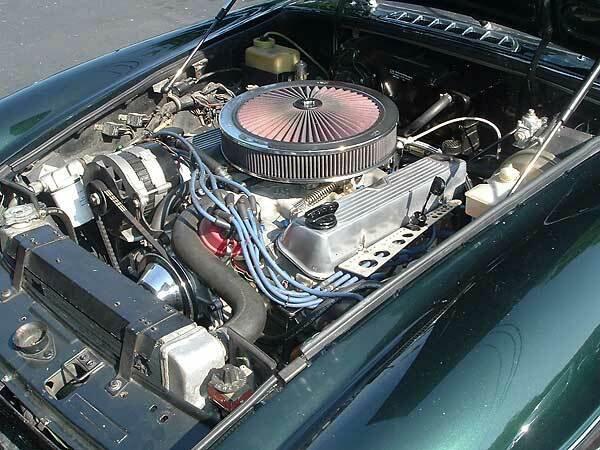 The rest of the cast went for such things as a new radiator, driveshaft, motor mounts, exhaust system and the hundreds of other small parts that were required to convert the sports car from its original four cylinder to the powerful V-8. The car runs smoothly, but when the accelerator hits the floor, you hear a nice growl from the twin chrome-tipped exhaust tips which poke out from under the rear bumper. McClain figures the Rover engine, which he fitted with a high performance Holley four barrel, special intake manifold, cam and exhaust headers, is pumping out between 180 and 200 horsepower. Swapping a four-cylinder for a V-8 is usually never an easy job, but McClain said he spent a lot of time researching just what the project would entail before he picked up the first wrench. In the early seventies, Rover built 2,591 V-8 powered MGs but did not export them to the United States. McClain said he located several businesses in England that sell parts for those original V-8 MGs and learned from them what he would have to do to convert his car. "I had all the parts before I put it together," he said recently while showing off the car during a Saturday night gathering of local hot-rod enthusiasts at the Steak & Shake restaurant in Altamonte Springs. McClain, who said he received a lot of help on the project from his friends, called the conversion a relatively easy one. He didn't have to engineer his own parts - Rover had already done that - or change the suspension system, because the lightweight V-8 is about the same weight as the old cast iron four-cylinder. "It's just a thrill to know you've put something together like this that performs like you expected it to... with no surprises."